Do you wake up in the morning feeling more tired than you were when you went to bed? Do you deal with stuffy sinuses that make it difficult to breathe? These are just a couple of the symptoms of obstructive sleep apnea (OSA). They’re not just annoying – they can also be life-threatening. OSA can lead to and/or worsen conditions such as heart disease and diabetes. And even the symptoms that aren’t life-threatening can be life-altering. Like an annoying neighbor who is constantly disrupting your life, sleep apnea can leave you feeling annoyed and frustrated. Fortunately, a sleep apnea dentist can help with the latest in sleep apnea treatment. This treatment is known as a DNA appliance. Today, you’ll learn why this appliance is gaining popularity amongst patients and how it can help you get a great night’s sleep. What Is a DNA Appliance? How Does It Work? Why Is It Used? This device is an FDA-approved sleep apnea treatment option. It differs from traditional orthodontic treatment because the focus isn’t solely on the teeth. With traditional braces or Invisalign braces, the teeth are progressively adjusted to create the ideal bite. This means the teeth fit together properly and there’s little to no crowding. Unfortunately, this type of treatment doesn’t take a holistic approach to the patient’s needs. When adjustments are made to the teeth only, it can have an adverse effect on the bones of the face. Many people who have had braces at an early age end up with nasal congestion and sleep apnea because the adjustments led to underdeveloped jaw bones and nasal passages. In the past, some of these people were diagnosed with ADD/ADHD, when in reality they were dealing with the side-effects of sleep apnea. The DNA appliance from your sleep apnea dentist only needs to be worn at night, but it can have a lasting effect on your airways. Even if you don’t have OSA, you’ll notice an improvement in your airways if you have any type of congestion. Though there is some movement of the teeth while wearing this device, once it is out of the mouth, the teeth move back into their natural position. What Do Patients Think about This Type of Dental Appliance? The idea of improving sleep in Chicago with a DNA appliance sounds nice, but what do patients have to say about it? Does it really work? Zack, a patient of Think Better Life, has nothing but good things to say about this appliance. After suffering for years with nasal congestion, he finally found relief after seeing his sleep apnea dentist. The results were apparent just after the first night! And that’s not all. After a few weeks of consistent use, Zack found that he could sleep through the entire night, and he experienced better quality sleep, too. Because of this, he felt more energized during the day and he looks forward to seeing how things improve over a longer period of time. Were there any issues with the DNA appliance? Zack said he had a bit of an issue talking while wearing the device, but it was tolerable, painless, and basically effortless. Multiple patients have tried this appliance and experienced similar results. And they say they would recommend it to anyone they meet who deals with OSA. This is a great period of time to be alive. Technology is constantly advancing, and doing so quickly. For patients dealing with obstructive sleep apnea, there are so many more treatment options these days than there were just a few years ago. Instead of having to wear an uncomfortable CPAP mask, you can wear a DNA appliance instead. If you struggle with OSA, you should talk to sleep apnea dentist right away. They’re always on the lookout for the latest devices that help their patients live healthier lives and that help them save time, money, and frustration. Talk to your dentist about your sleep apnea treatment options and you can end up getting better sleep in Chicago in no time! Would you like to know more about this sleep apnea device? 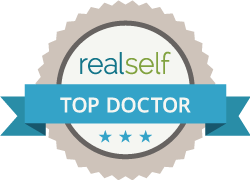 Contact us today to schedule a consultation and we’ll get you on the path to better sleep in Chicago! What do I do about sleep apnea and snoring? These symptoms could be due to sleep apnea. This sleeping disorder happens when you are unable to breathe easily while asleep because your airway is obstructed in some way. Not getting sufficient oxygen while you are sleeping means you haven’t achieved the deep sleep that is required for normal functioning during your waking hours. You may be unaware of your night time breathing problems, since you seem to sleep through the night. This often results in feeling tired even though you got a good amount of sleep. There are some new orthodontic treatments for sleep apnea which may help to alleviate these symptoms. These are called epigenetic orthodontics. Epigenetic orthodontics is a treatment specifically designed to grow jaws orthopedically and to grow airways pneumopediclly to prevent airway obstruction. This is different from typical orthodontics because it does not use heavy mechanical forces to move your teeth. Instead, a removable device called Daytime-Nighttime Appliance™ (DNA appliance™) is placed on your teeth throughout the evening and night, which lets the body alter the positions of your teeth more naturally and gently. Genetics is the study of genes and our genotype describes the actual genes in an individual. Phenotype is a description of how our genes are expressed. Epigenetics is the study of how environment changes our gene expression. The DNA appliance is used to correct acquired deformities and to bring out the ideal form and function. Dr Shapira recently lectured (March 2014) at the ICCMO meeting in Buenos Aires on the common developmental pathways of TMJ and Sleep disorders and the epigenetic causes of these problems. It has become common for children to do two step orthodontics with expansion (growth) being done as a first phase and braces or invisalign as a second phase of treatment. This has not been possible in adults until now. The DNA appliance allows us to grow and expand adults today . These newly developed DNA appliances™ don’t depend so much on the continuous force that traditional orthodontic braces use but instead they help to move the teeth, the jaws, the temporomandibular joint (TMJ), the face and the airway into better relationships which help to ensure adequate sleep and correct breathing. The DNA appliances™ are made with special 3-D Axial springs™, which do not require any adjustment on a regular basis but puts vibrations into the system which greatly enhances treatment. 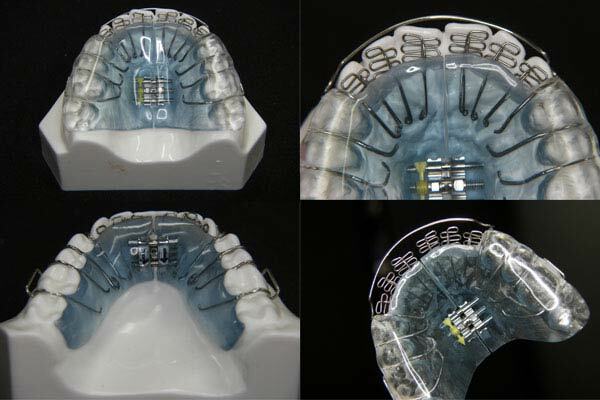 The RNA Appliance is a combination DNA growth appliance and a Mandibular advancement sleep apnea appliance. There are published case reports of sleep apnea cures from treatment with DNA and RNA appliances. Typical force orthodontics is a 4 step process. The force is appliaed leading to inflamation (and pain) which causes the bone to resorb, the teeth move into the area of resorbtion and consolidation occurs. Epigenetic Orthodontics eliminates the inflammation and pain by the gentle vibrations and the fact that movements are only 250 microns per adjustment. This eliminates most or all of the pain associated with orthodontics. The DNA device is the most recent non-surgical device now in use to help address the causes of sleep apnea. As an alternative to other forms of sleep apnea treatment, it works by naturally remodeling your airway. It widens your arch while altering your oral cavity’s shape. Its aim is to improve your breathing. Many people depend on other devices, such as continuous positive airway pressure (CPAP), which pushes oxygen into the lungs by force, but it is hard for many people to use. As well as helping to change the way you breathe, DNA straightens your teeth while creating more aesthetic facial features. A wide full smile is one benefit of the DNA Appliance but it allows us to permanently correct growth discrepancies without surgical intervention. While you may be excited about the creation of this new sleep apnea treatment, you should get an evaluation of your health status in relation to your snoring and breathing problems which will determine if DNA or RNA appliance is right for you. How loud do you snore? You may or may not be aware that you snore, but either way, loud snoring could be an indication of a medical problem, as it takes place when your airway partially closes during sleep due to the relaxation of the neck muscles. If you snore frequently and loudly you may have obstructive sleep apnea (OSA). This is where the airways become partially or totally blocked for about 10 seconds at a time. When breathing stops, the amount of oxygen getting to important parts of your body, such as your heart and brain, is reduced. As well as having a health aspect, if you snore loudly, it can also have an effect on your relationship, especially at night when your partner is trying to sleep. Recent studies have shown that heavy snorers can have up to a 600% increase in atherosclerosis of the carotid arteries just from the injury the vibrations cause. The carotids supply blood to our brain. This risk is in addition to the risks of sleep apnea. Patients with untreated sleep apnea have a 600% increased risk of heart attacks and strokes. In patients with previous heart attacks untreated sleep apnea is the greatest risk for repeat infarction and death. Your snoring is a warning sign to you that you; snoring could be a symptom of sleep apnea, which can result in serious health issues. There are some snoring solutions that you can undertake yourself. If you are overweight, losing some weight may reduce its occurrence. Smoking or drinking alcohol affects the soft tissues in your throat and they tend to relax more than usual which closes up your airways. The snoring remedy here is to give up smoking and reduce alcohol consumption, both of which may benefit you. Though weight, smoking, and drinking can be factors, snoring can have a deeper, dental cause. If you do snore a lot you probably feel tired during the day as you haven’t been getting quality sleep. If you don’t do something about it’s going to affect your job and your family relationships. Snoring and sleep apnea have been shown to be a major cause of divorce and marital strife. Fortunately, there are dental snoring appliances available that you can use to make you and your partner’s life far more comfortable. We can help you choose a non-invasive anti-snoring orthotic mouthpiece or mouthguard that will help you to sleep better at night. There is even an appliance (TAP) that has a volume control for your bed partner. If your snoring a simple turn of the knob can turn off the noise. There are several devices that can help prevent or reduce snoring. The first anti snoring aid is really designed for severe sleep apnea sufferers who snore loudly. This is called the continuous positive airway pressure (CPAP) treatment. It is a mask worn at night that pushes air into the lungs. 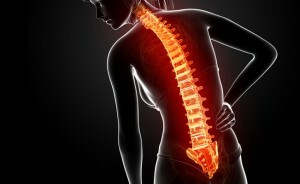 It can be effective, but is also rather clumsy and can be noisy and uncomfortable. 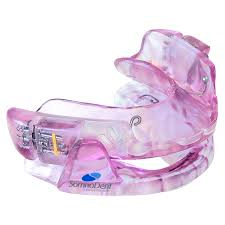 A more comfortable snoring remedy, is the mandibular advancement appliance. There are over 100 types of FDA approved mandibular advancement appliances. It is a plastic dental device worn over the lower and upper teeth that pushes the jaw forward allowing more space in the airway for breathing. The Thornton Adjustable Positioner (TAP) is an adjustable and comfortable appliance that we fit to suit the unique shape and size of your mouth. Its role is to prevent your airway from collapsing so that you breathe better, get more sleep and snore less. It is the single most effective appliance available. The Somnodent appliance by Somnomed is probably the most comfortable appliance. It is one of several dorsal fin mandibular advancement devices that allows free jaw movement. The SUAD appliance is a modified Herbst appliance that uses hinges to allow jaw movement. It is the most robust appliance for patients who break other appliances. As mentioned, snoring can have multiple causes; we can help to determine the cause of your snoring and whether a dental solution could be right for you.